Technicians preparing the shuttle Discovery for public display say the retired spaceship will be ready to leave the Kennedy Space Center in February for its new home at a Smithsonian museum annex near Washington. But the veteran spacecraft's piggyback journey atop a modified Boeing 747 carrier aircraft will likely not begin until April due to potential wintry weather along the East Coast, according to Stephanie Stilson, the NASA manager leading the shuttle retirement work at KSC. The specialized Shuttle Carrier Aircraft can only fly through fair weather with an orbiter riding piggyback. Discovery will take the place of shuttle Enterprise, a pathfinder vehicle used for atmospheric flight and landing tests in the 1970s. Enterprise is currently displayed in the Steven F. Udvar-Hazy Center of the Smithsonian National Air and Space Museum at the Washington Dulles International Airport in northern Virginia. Enterprise is heading for the Intrepid Sea, Air and Space Museum in New York City. Inside one of three space shuttle hangars at KSC, a team of engineers and technicians are preparing Discovery to leave the Florida spaceport for good. The work involves ridding the shuttle of toxic chemicals, removing avionics and wiring for inspections and putting the orbiter into the proper configuration for museum duty. The same team is busy working on shuttle Endeavour in the hangar next door. Endeavour returned from its final flight June 1. When a shuttle returns from space, officials want to quickly drain propellant, fluids and remove its three main engines. Workers finished taking out Endeavour's engines this week, and the shuttle's nose steering jets were also scheduled to be removed this week, according to Stilson. The standard post-flight procedures are called "down-mission processing" in NASA-speak. Faced with cutbacks and layoffs amid the shuttle retirement, managers are overseeing a smaller team of technicians to do hands-on work with the vehicles. "We have a scaled-down team compared to when we're processing a flight vehicle," Stilson said. "That scaled-down team is focusing all their efforts on Endeavour's down-mission processing." After the initial post-flight work, each orbiter will go through months of safing and cosmetic preparations for display. Discovery's main engines, tail orbital maneuvering system pods and forward thruster system were removed this spring. The OMS pods and nose steering unit are now en route to White Sands, N.M., where engineers will pull out plumbing and tanks that contained hazardous propellant during the orbiter's service life. The shuttle's thrusters burn a mix of hydrazine and nitrogen tetroxide propellants. The fuel and oxidizer compounds are toxic to humans. 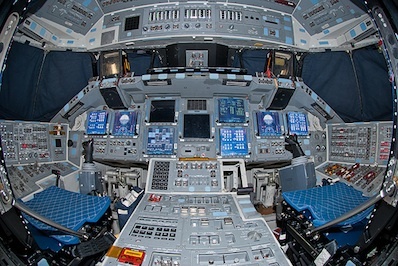 "We don't want any hazardous materials in the vehicle in the museums, so we're gutting those components and taking all the piping out," said Kim Guodace, a shuttle vehicle engineer for United Space Alliance. Once the toxic systems are removed, NASA will ship the maneuvering units back to Florida to be installed in Discovery again. Engineers will place replica main engines on the back of the shuttle before it's moved to a museum. The agency plans to retain the shuttle's fleet of hydrogen-fueled engines for potential use on future rockets. Discovery's robot arm was also taken out of the payload bay for inspections. Each orbiter will go through a similar series of steps before they are handed over to museums. 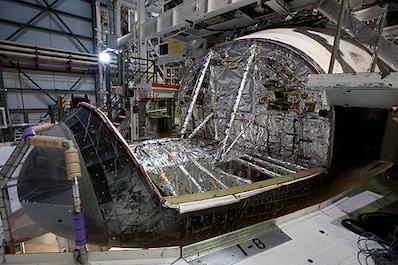 Endeavour will be displayed at the California Science Center in Los Angeles, while Atlantis will move to the Kennedy Space Center Visitor Complex. NASA is already decommissioning one of the space center's shuttle hangars, so managers are planning a juggling act to shift three vehicles among two processing facilities when Atlantis returns from the final shuttle mission in July. According to Stilson, Discovery will be rolled next month from its current location in Orbiter Processing Facility bay No. 2 to the mammoth Vehicle Assembly Building for storage. 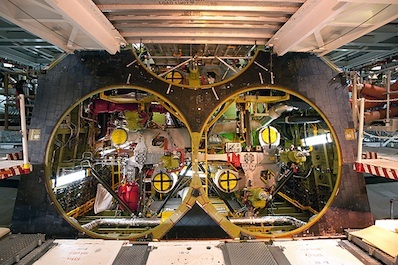 Atlantis will take Discovery's place in OPF 2 to start its standard post-flight safing procedures. This week, Stilson said teams are modifying part of Discovery's hydraulic system to deploy the shuttle's landing gear when it arrives at the Smithsonian display site near Washington, D.C. Although its last flight ended March 9, Discovery is still regularly powered up to monitor systems as engineers work on the ship. "We use power for any type of systems monitoring," Stilson said. "When we're going in and safing those systems, we have to be able to see those displays and understand how those systems are reacting as we're draining them and purging them. We use power for hydraulics. So right now, there are still a lot of power-up requirements on the books for us." Discovery made 39 trips to space in its 27-year operational career, deploying and retrieving satellites, launching the Hubble Space Telescope and helping construct the International Space Station. Discovery's last power-up is scheduled for around October, then the orbiter will go dark for good.